Mass media and society, a popular concept in media studies, has constituted much discourse due to roles media play in society and perceived effects that can result thereof. This chapter is inspired by the term ‘medicalization of the society' whereby ailments are regarded as medical issues and subjected to medical diagnosis and treatment, regardless of their true causes. Similarly, the violence, moral decadence and ethno-religious crises witnessed in the society are largely ascribed to the media. This chapter examined the said effects of mass media with society's social systems, cultures and values, with a view to finding a relationship. 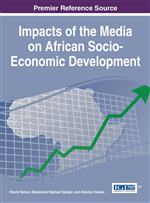 It argues that these societal makeups especially ones as formidable as Africa's also affect largely members' conducts and reactions to media contents. However, it advocates children's news segment, adherence to media ethics, and use of media programmes to enhance learning, proper socialization, abolishment of negative cultures, media literacy among others. Clearly, the number of life problems that are defined as medical has increased enormously. Does this mean that there is a new epidemic of medical problems or that medicine is better able to identify and treat already existing problems? Or does it mean that a whole range of life’s problems have now received medical diagnoses and are subject to medical treatment, despite dubious evidence of their medical nature? Inability to reach important goals. The implication is that certain illnesses and mental disorders have causative agents that spring from abnormalities in the social system – our society, and the medicals take the fall for them. A similar issue occurs when society ascribes the violence, ills and problems it witnesses to the mass media as the main causative agent. The media as the fourth estate of the realm in the society are saddled with numerous if not heavy responsibilities, ranging from surveillance to educating, informing and entertaining members of the society. They are expected to function effectively and live up to expectations. Yet, when they discharge these duties expected of them, they are accused of inciting violence among children and youths (Gerbner, 1980; Huesmann, Moise-Titus, Podolski, & Eron, 2003), raising fear of insecurity among adults through news contents, and reporting incidents of insecurity (such as terrorist attacks) especially in Nigeria. Ifeduba (2013) contends that there have been complaints of newly licensed media using their media platforms to incite ethnic animosity (Tettey, 2006), bias (Olorunnisola, 2009), irresponsibility and unethical practices (Skjerdal and Lule, 2009; Ifeduba, 2011). Media imperialism (Schiller, 1973, in Toholde, Olaniran and Aliede, 2015) is blamed for cultural deterioration in the society. Ifeduba (2013) asserts that there is a new genre of sport newspapers that devote their pages to European football leagues, a situation that seems to promote cultural imperialism since the publishers have access to local leagues and other sporting events but choose to publicise European leagues, clubs and stars.